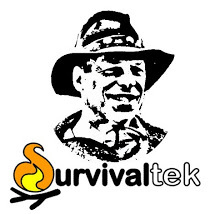 Now that survivaltek has a page on Facebook, I try to keep up with my friends. One of my friends posted the photo that grabbed my attention. Here is a down and dirty (and wet) application for duct tape. I sent a message to find out the story behind the picture. Apparently the shoe was already in “iffy” condition and was kept operational by repeated binding of tape (due to the wet environment). I guess the important point is that they had duct tape WITH THEM on the trail. In a previous blog “Repackaging Duct Tape” I show ways to carry duct tape in a compact way. Their method of wrapping it around their water bottle keeps it ready at hand. Be prepared and find a method that works for you. 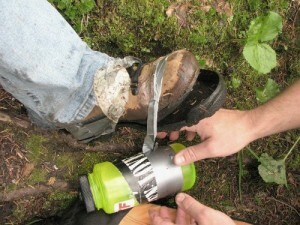 This entry was tagged Duct Tape, First Aid, Hike, Tape, Tourniquet, Trail. Bookmark the permalink.